Anger, it turns out, isn’t bad. In fact, approached with mindfulness, anger can become a uniquely powerful catalyst to growth and healing that will energize your therapy practice. In my Mindful Anger Workshop, I will walk you step by step through the transformational process that can bring life-changing wisdom to patients with issues of all types. Find out how to use anger as a key to your patient’s past and present, moving them to greater self-awareness and emotional release, empowering them to make lasting change. In this workshop, we will explore anger and how to transform it. I’ll introduce you to ways that you can help transform your clients anger and use it as a catalyst for growth and healing. “Dr. Brandt….I recently attended your seminar in Overland park KS. I have been in private practice for 24 years and have been blessed in every minute of it. 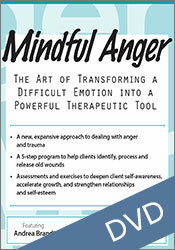 Wanted you to know I bought Mindful Anger and have been using the wisdom contained within with many, many of my clients. I am so thankful for you and your willingness to share the lessons you have learned through your own pain. Just know there is a psychologist out there in Missouri who thanks my Lord and Savior for you everyday. May you have a blessed Hanukkah” – – L.M. Anger, it turns out, isn’t bad. In fact, approached with mindfulness, anger can become a uniquely powerful catalyst to growth and healing that will energize your therapy practice. Noted author, speaker, anger expert, and marriage and family therapist Dr. Andrea Brandt will walk you step-by-step through the transformational process that can bring life-changing wisdom to clients with issues of all types. Find out how to use anger as a key to your clients’ past and present, moving them to greater self-awareness and emotional release, and empowering them to make lasting change. Case studies drawn from real-life situations, combined with Dr. Brandt’s “let’s get real” communication style, close the gap between seminar lecture and your daily practice. You’ll go home with a catalog of simple exercises that you can use to engage your clients in the mindful anger process on their very next visit. April 30 – LIVE SEMINAR – Available to all!